Every social phenomenon has to be understood in the context of its time but sometimes the pattern of history seems uncannily similar. 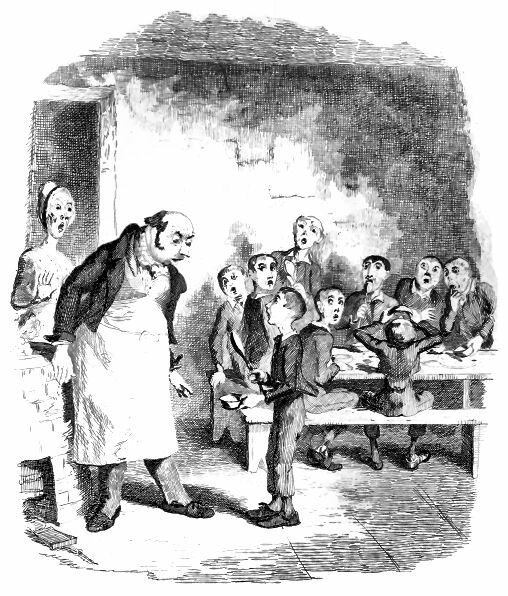 Ironically, campaigners in London are currently trying to have the workhouse used as the model for the one in Charles Dickens’ Oliver Twist scheduled as a listed building (to avoid its destruction by “redevelopers”). And at the same time the Lib-Tory coalition is bringing in its own form of New Poor Law. Curiously too the background has some of the similarities of 1834. The cry for reform of the current welfare system is not new but the depth of the crisis, and (following the bank bailout) the size of the hole in Government revenues, has suddenly made the issue more urgent. The welfare budget was over £100 billion in 2010 so the clamour for cuts has become noisier. The focus so far has been on the absurdities of the physical disabilities that have been discounted by the WCA: claimants have to score 15 points to stay on the full allowance. A person with multiple sclerosis scored zero, despite a surgeon's letter stating he was too ill to work. Someone who was registered blind was found to have "mild visual impairment". … the assessment for those with mental illness is even more bafflingly inadequate. Atos, the company responsible for the assessments, does not require staff to have any training in or understanding of mental illness. There's an anecdote about an assessor telling a claimant that because he wasn't rocking or sitting in a corner, he obviously wasn't unwell. Claimants are asked how they arrived at the appointment: if they managed to take public transport alone, and are presentably dressed, this counts strongly against them. Likewise, if they are articulate. So there's no acknowledgement that mental illness fluctuates, and someone might be fine on one day, but incapacitated the next. And if you are struck down by cancer you will only be given an employment support allowance (ESA) for one year. 75% of all survivors of cancer take more than one year to recover. This is the modern version of “less eligibility”. According to a study by Scope, the disabled people’s charity (see the Financial Times Oct 8 2010), people with disabilities will have lost a total of more than £9bn in income by the end of this parliament even before the latest cuts are added in. A lot of this will be because of the cuts in housing benefit as the disabled need to claim for specialist accommodation. At the same time about a quarter of the 2.2 million on incapacity benefit will be shifted on to the dole or jobseekers’ allowance. The main idea behind this is to cut the welfare bill by £35 per person per week since they lose attendance allowance. For claimants it also means the humiliation of having to constantly prove that they are “actively seeking work”. The National Housing Federation (NHF) claimed the cap on housing benefit payments amounted to an "onslaught on the vulnerable", which would cost more than 900,000 low-paid people an average of £624 a year – forcing them into debt or homelessness. The right wing press for years has been full of stories of dole scroungers. Leaving aside the fact that more benefit goes unclaimed than is lost to fraud the new poor law has other aims than hitting the workshy. Superficially it seems to be forcing people to get a job at a time of mounting unemployment. This is the old principle of “less eligibility” in a new guise. In reality there is no possibility of a system in crisis reintegrating the reserve army of labour. 2.5 million UK unemployed is now considered normal and acceptable. Consequently the new legislation will reduce the reserve army of labour to penury. But it is not just those out of work who will be hit. Iain Duncan-Smith recognises that “One of the biggest problems is that for too many people work simply does not pay”. Well done IDS! However he does not then draw the obvious conclusion that this is because wage rates have gone down in real terms for 35 years. No, the problem is that benefits are too high (even though no-one can live comfortably on them). Whilst a major short term aim is to save the debt-ridden state £15 billions a year from it annual outgoings, the new welfare regime is also intended to keep forcing down the cost of wage labour to increase capitalist profitability. A small but niggling point. Yes, we run the capitalist bakery, but do we really want to take it over, like in workers' self management? That's what the leftists would have us do! When we smash capitalism, then we'll run the bakery, but the bread will be free and delicious. In other words, it won't be a capitalist bakery anymore. We need to be clear about this, don't we? No need to add to all the confusions out there. Point taken (it was also made by another comrade when he saw it printed). The metaphor was not intended to imply simply workers control but that we have the power in our own hands to stop the system. Dear Cleish, why do you say it cannot last? TheState is cranking up it's attacks on everyone everywhere. They can do this forever. With the sort of passivity manifest yesterday (June 30) who's going to stop them? A few anarchists?